It began with a gathering of friends and strangers. Professional artists and beginners. Exquisite date loaf and not-quite-cooked-in-the-middle chocolate cake. As 11 participants settled in to begin a journey of discovery a hint of apprehension and awkwardness hovered. Where do we start? How do we start? How do we mix the colours? The answer... have a go, be bold, make mistakes, be proud of small achievements and in 30 years time you will still be learning. 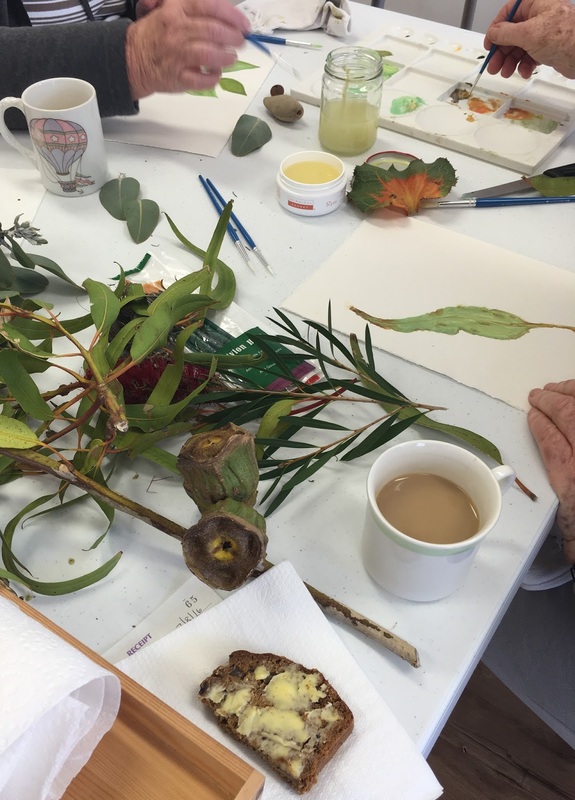 There was a plethora of plants, nuts, and flowers to paint and the smell of bush treasures in the room was lovely. 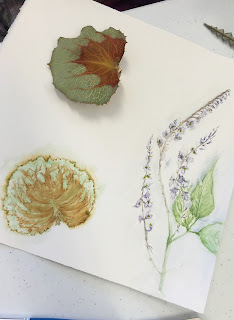 Form started to take shape on paper after some deep thought and botanical images were clearly evident. By the end of the first day and after some tips and demonstrations had been shared, the work produced by participants was really quite amazing. 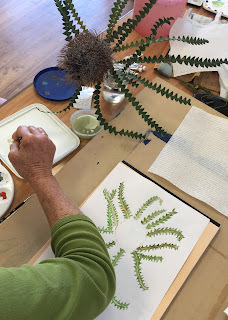 Day 2 of the workshop arrived and by golly, participants were done with simple leaves. It was now time to have a crack at banksias and hakeas! Confidence had grown to say the least. The results were a true achievement. I think it is pretty safe to say that painting Botanical Art is hard work. It requires patience, concentration, time, and a good Date Loaf. Congratulations to the participants who made this artistic workshop part of their learning journey. The weekend of 6th and 7th of August saw Windsprays Art Hub on Maitland Street full of studious artists. 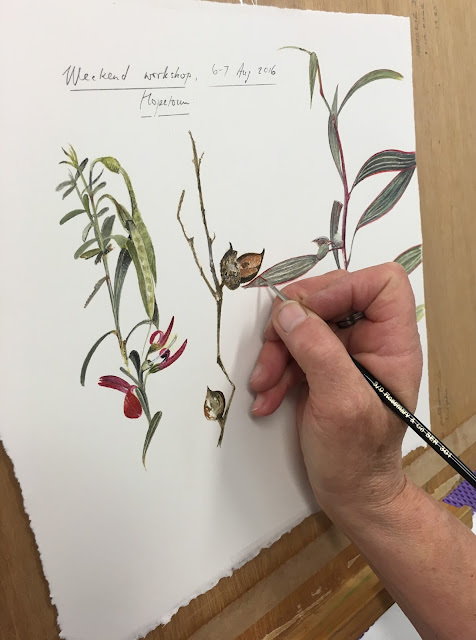 Penny Leech, an original founder of the Botanical Artists Group of WA graced the group with her faultless botanical art. If nothing else it was mesmerizing watching her work away with ease to create perfect botanical images. Thank you to Penny for travelling to Hopetoun. There is still a lucky group who will be joining Penny on her next visit to Hopetoun September 3rd and 4th. Thank you also to Beryl, our gracious Windspray host and baker of Date Loaf. And of course our hard working participants who achieved so much in a short amount of time. Looking forward to seeing some completed works in 30 years time. Patches from the People, Please. There is a scent of Mystery in the air at the moment. A fresh scent. 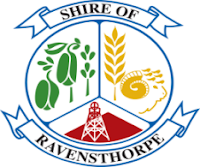 A seed has been planted, and a mystery vine is going to grow amongst communities surrounding the Ravensthorpe Shire. Lets water that vine, and see what Mystery reveals itself. Once loved fabrics. A hanky with a happy memory? An old beach bag from the Endless Summer of '66? Did you measure once and cut twice to ruin a vintage piece? Consider contributing to Ravensthorpe Regional Arts Councils Mystery Community Project. We have an idea, a big idea. A large scale mystery textiles project will come to life, and we need Patches from the People, please. All are welcome to participate. Textile patches may be any shape or size up to 1m x 1m. 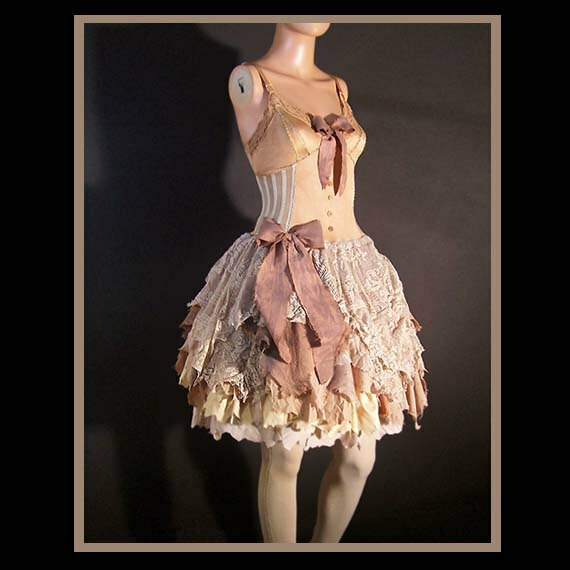 Your patchwork piece will be utilized and exhibited as part of a large scale mystery project. 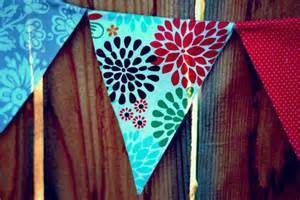 Fabrics may be decorated any way you choose including; traditional patch working, painting, embellishing, drawing, or just a pretty piece that you would like to see included. Patches will be required by the 2nd of September. The Mystery Project unveiling and sew-a-thon for the construction of the project will be held at Hopetoun Community Centre 3rd and 4th of September. BYO sewing machine. The project will be exhibited at the Ravensthorpe Wildflower Show from September 13th to 24th, and who knows where it will pop up next? 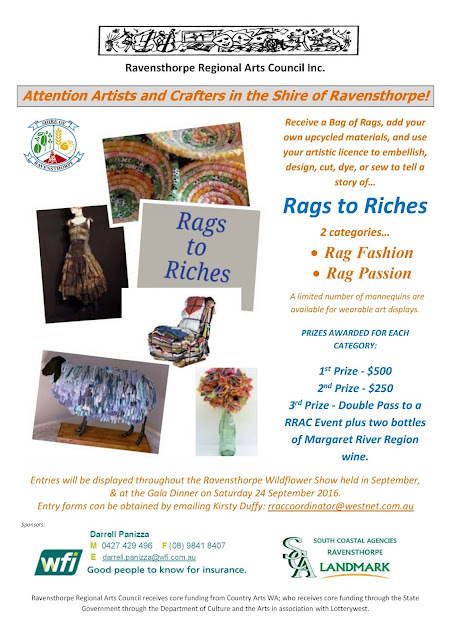 Rags to Riches, a Rag Art Project. 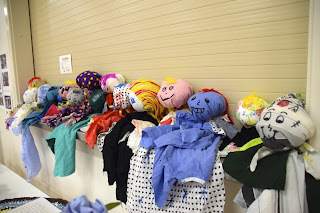 Rags to Riches is a rag art project with heart. Everyone has a story to tell, a pillowslip, a baby blanket or a hat tucked away in the cupboard with special memories. The time has come to drag your memories out of storage and create an artistic piece. Originally a concept by Sue Leighton, Ravensthorpe Regional Arts Council is going to give you a little nudge, in the form of a bundle of rags, to get the inspirational juices flowing. 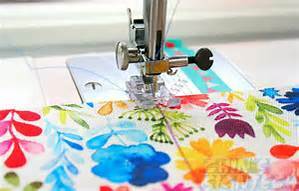 With a prize pool of over $1,700, now is a good time to start sewing, tearing, twisting, cutting, and embellishing. Don’t think that your merry road to creation needs to be paved from Rags only, you are free as a bird to add wood, metal, straw, plastic, anything your heart desires. For judging purposes there will be two categories; Rag Fashion and Rag Passion, and there are a limited number of mannequins up for grabs to display wearable art pieces. The choices are endless. You can make anything. handbag from an old pair of jeans, or even a scarecrow, as long as you include a rag from your bundle. There are some very talented community members amongst us, so who knows what the end results will bring? Thank you to those who have come on to support the project, WFIs Darrell Panizza, and Kyle Forsyth and his team at Landmark Ravensthorpe. We are hoping for a few entries from the blokes too, so get out your staple gun, grab a bundle of rags from the Hopetoun Community Resource Centre or Landmark in Ravensthorpe, and get cracking on your project. The project entries will be exhibited throughout the Ravensthorpe Wildflower show which will run from 13th to the 24th of September 2016. For more information, contact RRAC Coordinator Kirsty Duffy on 0438 945 405, or rraccoordinator@westnet.com.au .